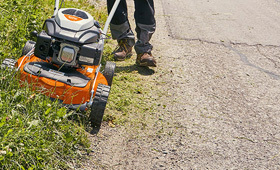 The STIHL professional lawn mowers are a reliable partner when it comes to professional lawn care. Their robust construction, powerful engines and a high degree of functionality and ergonomics are the exceptional properties which enable these mowers to be used wherever they are needed. For example, for lawn care in local authority areas, parks, swimming pools and leisure centres, on playgrounds or along roadways. In daily practice, these high performance lawn mowers demonstrate why they belong in the professional class. Virtually no other lawn mower offers more in terms of performance, robustness and ergonomics.